Nachos, quesadillas, burrito bowls, taco salads … and ice cream! Proudly serving Starbucks brand coffees and teas, as well as chilled beverages. Located at one end of the CGUS (Center for Graduate & Undergraduate Studies), the Socrates Café dining area is an active place for students and the LIFE Community to eat, study or just socialize. The dining room has seating for more than 250, not including the Presidential Dining Room (PDR), which can be divided into two separate meeting areas. Additionally, the entire south wall of the Café opens to an inviting outdoor patio area with shaded seating areas featuring a fire pit, a reflection pool and calming water streams. The dining room features high ceilings, natural lighting and booth seating with flat screen monitors that you can connect to your laptop. There are four flat screen displays in the center of the space that show news, sports and campus event calendars – there’s even a drop-down projection screen that can be used for event presentations and is often used for LIFE sporting events. Affordable, healthy menu items are prepared to provide something for everyone, and when possible, include locally sourced and/or organically produced options. We strive to obtain as much produce and protein from local farmers and other vendors committed to sustainability and humane treatment of animals. Plato II Go features our fresh, made-from-scratch Tex-Mex menu, as well as a variety of additional hot menu items. Eagles’ Landing is our own Starbucks branded beverage stand, located down the main hall of CGUS. It serves all your favorite Starbucks beverages, both hot and cold. 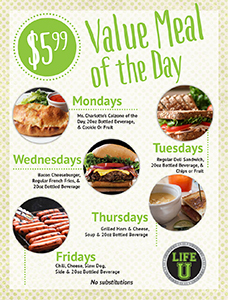 For more info on Food Service operations, email Cafe@LIFE.edu. Food Services are closed on Graduation Day and during school breaks. There are several established “Special Service Days” throughout the year, which include (but are not limited to) L.I.F.E. – LIFE Involvement and Fair Experience (formerly First Thursday), OSCEs, National Boards and Final Exam Week. During these periods, there may be adjusted openings for the venues, as well as reduced menu selections. Generally, Socrates selections will be limited to one soup (instead of three), salad bar, pizza, deli and grill items, with no prepared hot line. Note: Food-allergic individuals, please be aware that we handle and prepare egg, milk, wheat, shellfish, soy, peanut, tree nut products and other potential allergens in our cafe and kitchen. The sustainable way to enjoy your to-go meals at LIFE U! an EcoTainer at a participating location: Lyceum Dining Hall and Socrates Cafe. $8.00 for the container. your dirty EcoTainer at the participating location for a clean one or use a token to use for redemption later. The container is yours for the rest of your time at LIFE U. Welcome to Life University Dining! Our mission is to be your first stop for all catering services and to provide you with exceptional quality, exceptional service and a creative cutting-edge culinary experience. Whether planning a simple breakfast or an upscale executive luncheon, you will find all of our most popular menu selections online. Click https://lifeuniversity.catertrax.com/ to get started! Read about Meal Vouchers/Meal Cards here.